Sensory bottle tutorials have been all the rage on Pinterest lately. After seeing all of these posts, I decided to sit down and make my own. While many of the sensory bottles have some type of liquid inside (hand soap, hand sanitizer, glue, etc. ), I decided to make this one without any liquid inside. Although the liquid sensory bottles are mesmerizing and super beautiful, I wasn’t thrilled with how heavy they are! If your little one is playing with and accidentally drops it, it’s going to hurt if it hits them. This bottle is super lightweight and won’t hurt if it gets dropped or thrown. 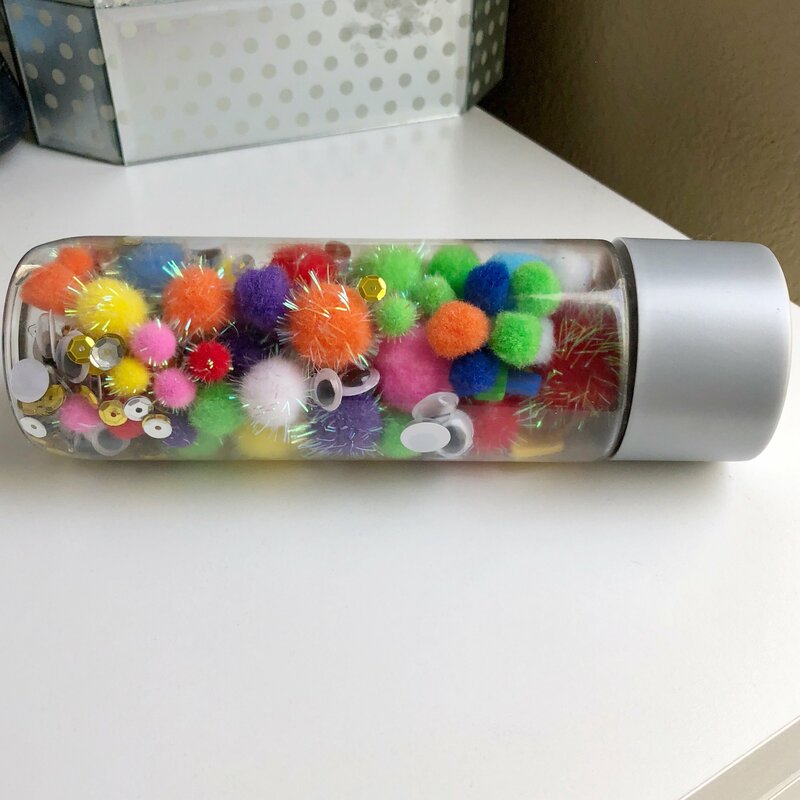 Read along to find out how quick and simple it is to make this fun sensory bottle that will surely capture your little one’s interest! This project can absolutely be done in 5 minutes, but you also may find yourself tinkering with it for a bit longer. It’s totally up to you! As noted above, make sure that your VOSS water bottle is dry and that the labels have been removed. Gather all of your supplies. 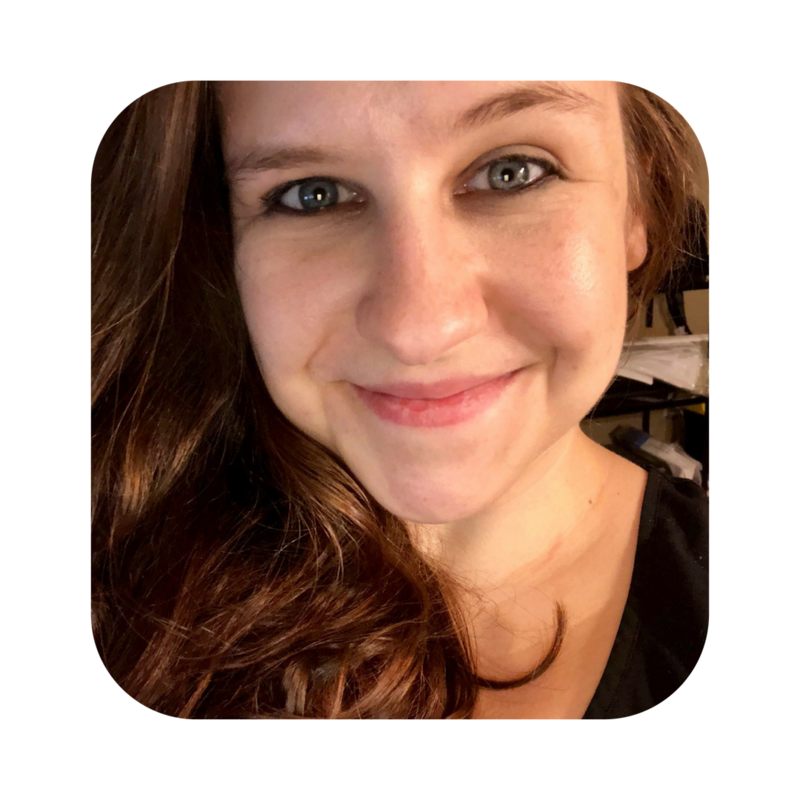 You are going to want to add a little bit of everything in layers, so I’d open everything and have it all easily accessible. Begin placing the supplies into the bottle, observing how things move. NOTE: The pom poms will make it hard for other objects to move around in the bottle, so be sure to keep this in mind. Place the lid on your bottle and give it a few shakes. How are things looking? If you like how it is going, keep going until you reach the top of the bottle. You do not want to stuff the bottle. Make sure you’re leaving enough space for things to move around. Place the lid on your bottle and give it another few shakes. How is it looking now? If you like the finished product, grab your super glue and line the bottle opening before screwing the lid back on. If you DO NOT like the end product, feel free to dump some or all of it out and try again! The contents of the bottle are always shifting, which encourages your toddler to engage with the toy. With bright colors and different textures inside the bottle, your little one will be intrigued. Using the technique described above, your bottle will be lightweight, which makes it easy for your little one to hold it, and it also means that it won’t hurt when they drop or throw it. The bottle makes a slight noise when you shake the bottle (due to the sequins and googly eyes), which kids will love. However, this isn’t a very noisy toy at all! 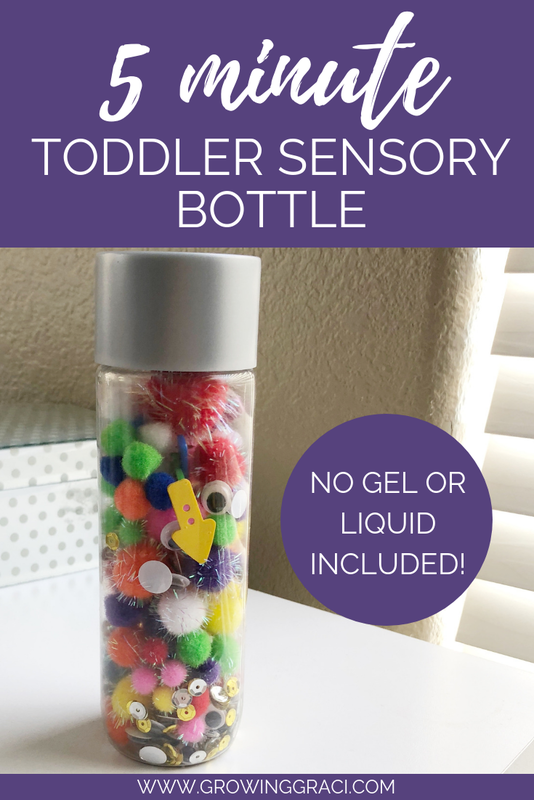 Unlike the gel or liquid sensory bottles, if the lid ever does come off (which isn’t super likely), your mess will be vacuum worthy – not a bunch of soap, glue or hand sanitizer all over the place. Since the toy is lightweight, it’s easy to throw in a bag for on-the-go, and I’m all about toys that are easy to take with us! I’ve included options on Amazon for everything EXCEPT super glue, since you probably have one around the house! If not, any super glue will work. The big pack of pom poms also includes the googly eyes! These are not the exact pom poms, googly eyes, sequins or pom poms. However, I did search through Amazon to find ones as similar as possible to what I used. Please note the following are affiliate links.